In recent years drapery hardware had been slimming down, and I’m sure we’ll still see a lot of it, but it seems that big may be making a comeback! If you’ve got a large room and the ceiling height to pull it off – go big in your home! Big is beautiful! These 3 1 /2”(id) x 5 1/8” (od) rings are getting the gold leaf treatment – making them big and glamorous! 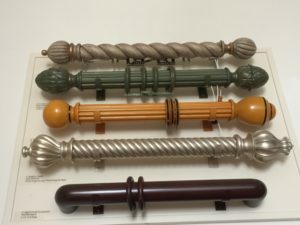 Rings and Rods of this size are meant to be among the starring players for these window treatments. The fabric, the rods and rings all work together to make an impressive statement within the overall décor and scheme of the room. In addition, choosing “too-small” drapery hardware can ruin a design. Scale is one of the most important considerations when making design decisions. One way to keep that critical balance in place is through thoughtful choices with drapery hardware – it’s just one more tool to creating the perfect room for your client. So, when making decisions for your next project, ask yourself – should we go Big In This Home? !